The new Canon 4K projector is designed for situations in which very high resolution and bright output are required. The Realis 4K500ST Pro AV LCOS projector offers 5,000 lumens and a 4K lens. Canon's first 4K projector will be available to higher education institutions in April. Canon officials said the high resolution makes it suitable for circumstances where immersive simulation is called for and is designed to exceed the resolution offered by conventional 4K digital cinema. With a native resolution of 4,096 x 2,400 pixels, it is intended for situations in which very high resolution and bright output are required. "Demand for 4K projection display continues to rapidly expand," said Canon USA President and COO Yuichi Ishizuka, "and Canon has responded by developing a unique model that combines 4K resolution and high brightness in a compact form factor." 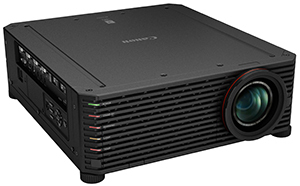 The REALiS 4K500ST Pro AV LCOS projector offers 5,000 lumens and a 4K lens provides marginal focus, which would allow images projected on a domed surface to stay in focus. Because the projector does not require large lamps or cooling systems to attain 5,000 lumens, it is fairly light, weighing in at 38.8 pounds. The 4K short-focus wide zoom has a throw ratio of 1.0 to 1.3:1, meaning it can project a 10-foot wide image from a distance of 10 feet. Along with the high brightness, it has a contrast ratio of 2,500:1. Memory color correction that enhances skin tones and other color features. The REALiS 4K500ST Pro AV LCOS has four DVI and two HDMI inputs that support configurations for 4K, 2K or HD video playback. When available this spring, the suggested list price will be $54,990. For more information, visit the Canon site.